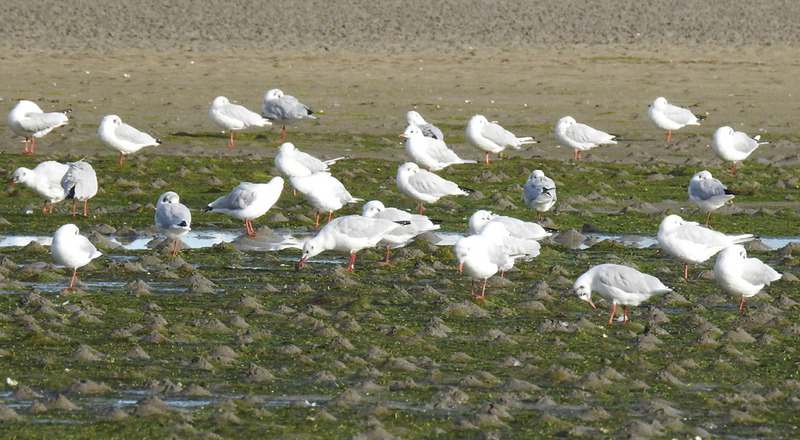 Sandymount Strand Tern Roost - 31st August 2017. South Dublin Members from the back at Sandymount Strand. Picture by Niall T. Keogh. 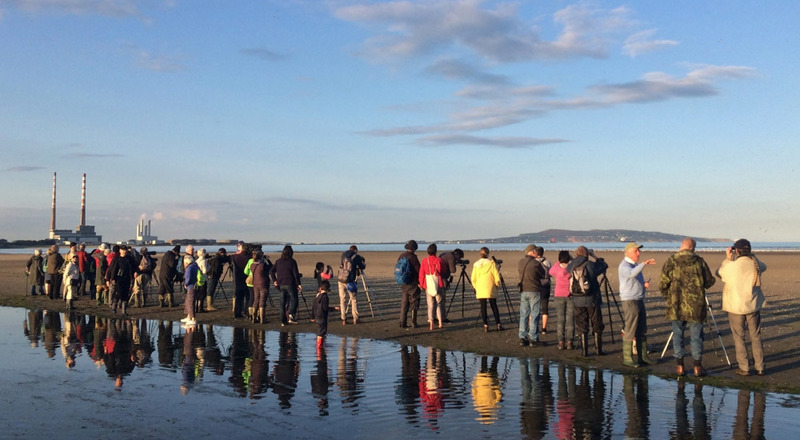 The end of summer tern roost at Sandymount Strand can be a spectacular sight. The roost consists of terns that have spent the day feeding around various Irish Sea sandbanks in preparation for their long migration to African wintering grounds. Most are birds that bred in Ireland, augmented by others coming from British colonies or further afield. 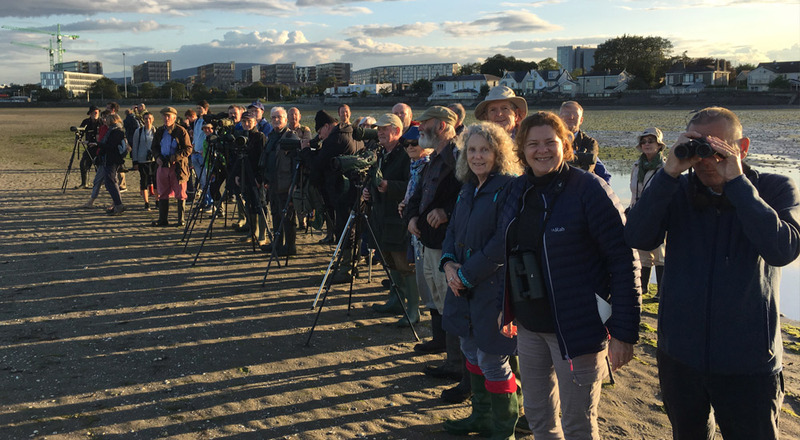 About 50 South Dublin members assembled near Merrion Gates at 7pm before heading out on the strand to get a better and closer view of the birds. On arrival the tide was way out but flooding, and the hope was that it would gradually drive birds ahead of it allowing us get good views. It was a bit early for terns but many gulls were spread out around the strand as well as along and near the shoreline. Most were Black-headed and Herring Gulls as well as smaller numbers of Common, Lesser Black-backed and Mediterranean Gulls. 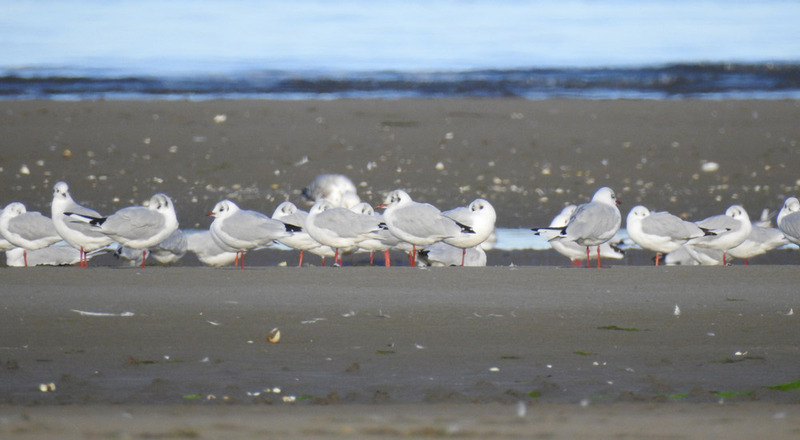 An orderly line of Black-headed Gulls. Picture by Luke Geraty. The distant sound of calling terns announced their arrival and we began to pick out groups of them over Dublin Bay, clearly heading inwards. It looked like we were in luck and would soon get views of these beautiful birds on the deck. 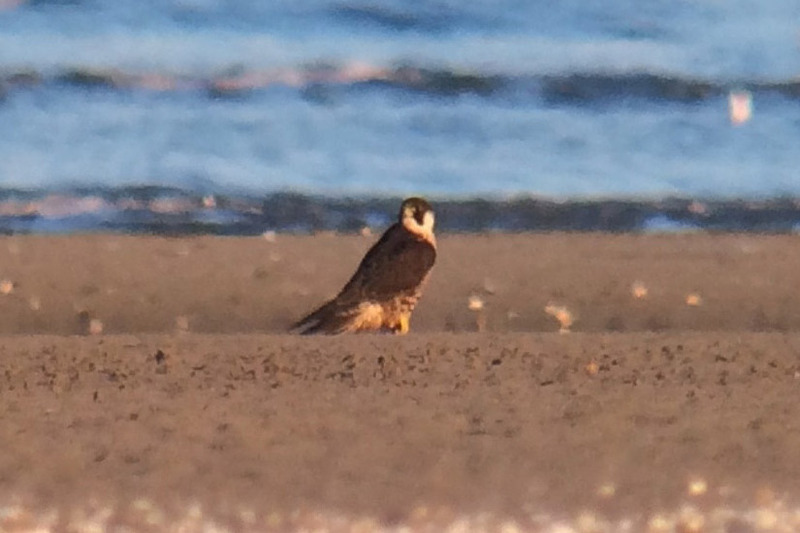 That prospect was soon shattered with the sudden arrival of a Peregrine Falcon that disturbed everything, putting thousands of birds in the air. 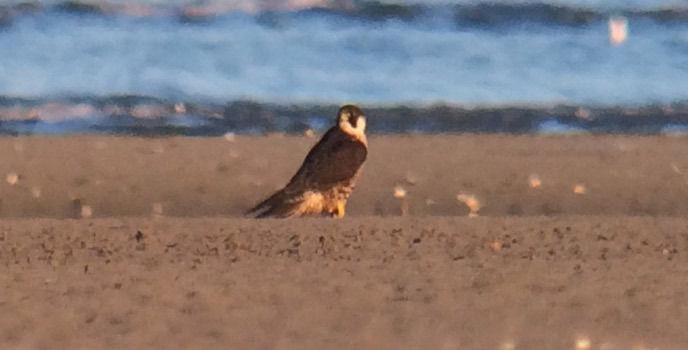 It flew about for a bit before settling on the strand where it attempted to appear disinterested in its surroundings. This nonchalance fooled nobody, especially any bird that was a potential meal. It took a while for things to settle down after that. Juvenile Peregrine Falcon taking in its surroundings. Picture by Niall T. Keogh. As the evening wore on, more and more terns came in. The majority were Common Terns, but the flock also included Arctic and Roseates, but unfortunately no Black Terns were noticed. They favoured an area towards Irishtown, which was at a distance off that did not allow close up views and the gathering gloom did not help either, but the drama of thousands of terns landing and taking off was considerable and everyone seemed to enjoy the outing. Thankfully the forecast of rain showers did not materialise and we enjoyed a beautiful evening. 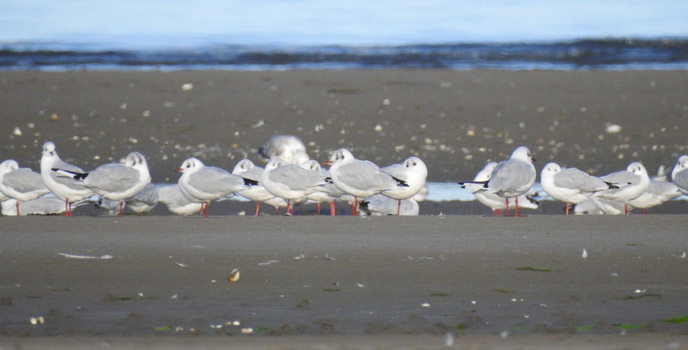 More Black-headed Gulls. Picture by Luke Geraty. Some more pictures taken on the day by Luke Geraty and Niall Hatch. 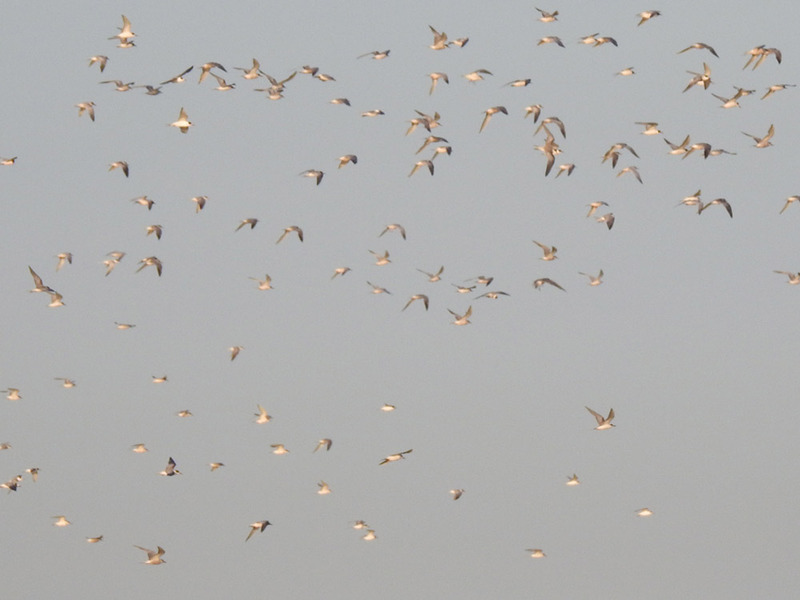 Some of the six thousand plus terns on the evening of 31st August. Picture by Luke Geraty. 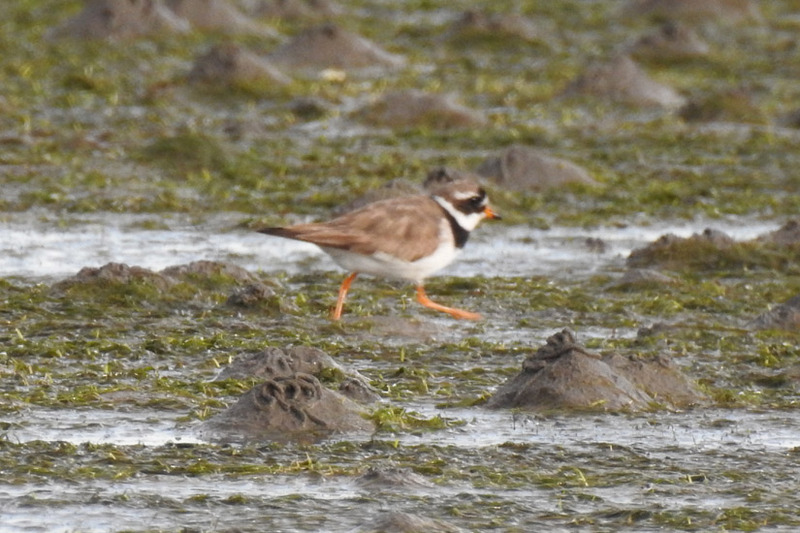 Ringed Plover on the go. Picture by Luke Geraty. South Dublin members from the front at Sandymount Strand. Picture by Niall Hatch. Apart from gulls and terns, we had a few Little Egret, Dunlin and Ringed Plover as well as good numbers of Oystercatcher and there were Great Crested Grebe on Dublin Bay. 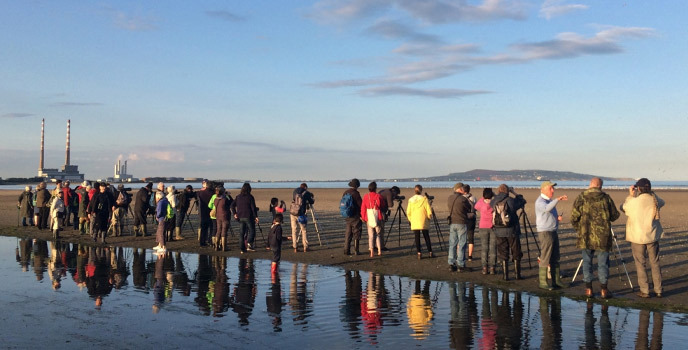 Ricky Whelan of BirdWatch Ireland, who was undertaking a BirdTrack census on the same evening at Sandymount counted a total of 6,600 terns overall. With darkness approaching and the tide rushing in we called it a night at about 9pm and heading home.